Pigs have always had special meaning in human culture. They are deeply entrenched into our religion, heritage, and even our economy. Ever wondered why your coin collection is always placed in a 'Piggy bank'? In many cultures, a pig represents Wealth, Prosperity, and Abundance. Having a feast of the animal is a status symbol. The more pigs you have, the richer you are. Celtic folklore speaks of Manannan's herd of magical pigs. The Celtic god of the Sea held an annual 'Feast of Age' and dined on his self replenishing herd. Dining on Manannan's herd meant that guests could stave off old age. Even our language has been touched by pigs! You can be happy in Hog Heaven while pigging out on your favourite treat, but your partner won't be happy if you make a pig's ear of putting together the kitchen cabinets. "I was sweating like a pig the other day when I went to the bank for a car loan. Of course, the loans officer told me that I should always test drive a used car before buying it to make sure that I'm not getting a pig in a poke." There's an old naval tradition which states that any sailor wearing a tattoo of a pig on the right foot and a rooster on the left will never drown. In fact, he can walk on water. The myth started early in maritime history when a few captains noted that while ships carrying livestock as cargo usually sank, the crates that had pigs or roosters always seemed to float. Whether or not you believe the myth, having a Rooster and Pig tattoo shows your link to the Navy and old seafaring traditions. A Wild Boar symbolizes Strength, Virility, and Dominance. It's impossible to tame such a majestic animal and persons wearing Wild Boar tattoos are acknowledging their powerful persona and rebellious side. The term 'when pigs fly' can be traced back to the 1600s when it was mentioned in John Withals' English-Latin Dictionary, A Shorte Dictionarie for Yonge Begynners. "Pigs fly in the ayre with their tayles forward"
It is generally used to imply the impossibility of an event happening. 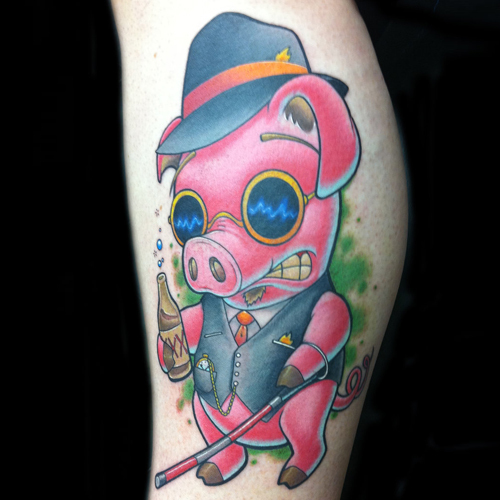 Wearing this tattoo is a tip of the hat to your comedic side and a fun way to associate yourself with a happy, go-lucky pig. Tribal Pig tattoos are closely linked with the image of a Wild Boar. They represent closeness with Nature, Power, Strength, and Freedom. Since tribal patterns often have links with Spirituality and a particular indigenous culture, wearing these designs is also a way to acknowledge your philosophical nature. Statistically speaking, most Pig tattoos are cute reminders of our childhood. They often incorporate comical cartoons, like the lovable, stuttering Porky Pig. In a sense, these tattoos symbolize childlike Innocence, Happiness, and a longing for the good ole days of Youth. Since your new ink can't be erased with a Mr. Clean Magic Eraser, it's important to choose a design that not only speaks to your personality, but also looks good on your body. Think about what your new tattoo will symbolize and find one that conveys the message that you're trying to express. If you need some inspiration, then visit our design page at www.itattoodesigns.com or take advantage of our Custom Design Service, where our team can design a truly unique piece for you.